Mobile Commerce - iPhone Or T-Mobile G1? As you probably know, gentle reader, I have been agonizing over whether to get the iPhone to replace my current HTC Wizard Windows Mobile phone or wait for the Google Android phone. The deal-killer for the iPhone thus far has been its lack of copy and paste functionality. Well, it appears it’s crunch time. With the announcement of T-Mobile’s G1 Google/Android phone, I will now have to choose. 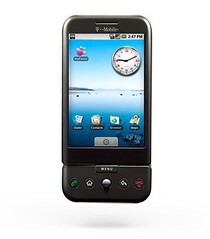 The G1 specs include a 320×480 TFT-LCD touch screen, broadband Internet access, WiFi, Bluetooth, GPS, a motion sensor, a 3.2 megapixel camera, a removable battery, 1GB (up to 8GB) microSD card, a slide-out five row QWERTY keyboard, and a trackball. The G1 has its own media player, integration with Amazon’s MP3 store, Google Apps and Maps integration and it uses Google’s new Chrome browser. AND there is at least some copy and paste functionality! At $179, the G1 is less expensive than the iPhone and the data plan through T-Mobile is less expensive than iPhone’s AT&T plan. The G1 matches all the features that are important to me, and it has copy and paste functionality so I can be far more productive with it than I would on an iPhone. I have had a Sidekick and now have my HTC Wizard, so I’m used to and very fond of actual QWERTY keyboards. By contrast, I do not like the iPhone’s virtual keyboard. The only drawbacks to the G1 are the lack of Microsoft Exchange support and it’s just not as pretty a phone as the iPhone. But functionality is more important to me than aesthetics, so I can live with that. As you can see, I’m leaning toward the G1. What really has me intrigued and sells me on the G1 is the Android open source operating system and the fact that the Android Marketplace for downloadable applications will be open to all developers. Unlike Apple’s iTunes, anyone can offer their application through the store and there is no application process. That combination means that over time there will be far more options, features, and functionality for the G1 than for the iPhone. It also means someone (i.e. Microsoft) is likely to quickly develop an app that adds Microsoft Exchange functionality to the phone. In the end, open systems always beat closed systems: AOL vs. The Internet, Encyclopedia Brittanica vs. Wikipedia, iTunes vs. Android Marketplace. The Advent Of Mobile Commerce? payment methods but takes advantage of new marketing technologies. The ultimate goal, of course, is to turn your phone into your credit card. Throw in camera phones with barcode-reading software like Samsung is doing, and apps that read barcodes to compare prices among merchants or to tell you just how green products are, and you’ve got a revolution in both commerce and consumer choice. Welcome to the brave new world of mobile marketing! Hopefully the G1 will still be enough competition to get Apple to ease up with the NDA and App Store nonsense and address a few of the other chestnuts like Copy and Paste.